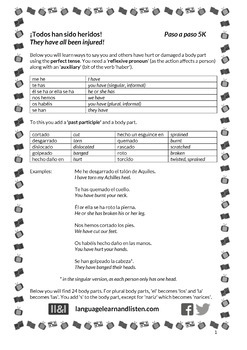 In this worksheet you will learn how to say you and others have hurt or damaged a body part using the perfect tense, with the appropriate reflexive pronoun. 24 body parts are used. There are 2 exercises (Spanish to English and English to Spanish) and all necessary vocabulary is provided. Suitable for all levels of ability. Answers provided.